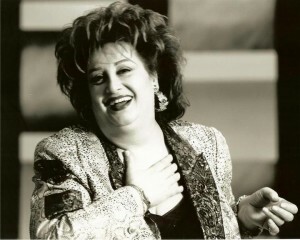 Soprano lyrico spinto, Françoise Pollet obtained a unanimous First Prize in Singing at the Conservatory of Versailles in 1972. She then left France for Germany, where she received the guidance of Ernst HAEFLIGER, Erik WERBA and Hermann REUTTER at the Musikhochschule of Munich (Bavaria). At the end of her studies in 1976, she received a Künstlerisches Staatsexam für Sologesang (German National Examination). Driven by the desire to perfect her knowledge and abilities, she joined the Bayerischer Rundfunk (the Bavarian Radio’s chorus), linked to the two orchestras of the house, under the artistic direction of Rafaël Kubelik (1976-1983). Laureate of the international Concours de Genève in 1981, she started her career in 1983-1984 with the Lubeck Opera Company. Her first part was the Marschallin (Rosenkavalier / R. STRAUSS). During three years at the Stadtstheater, she sang Die Mutter (Hänsel und Gretel), The foreign princess (Russalka), Giulietta (The Tales of Hoffmann), Santuzza (Cavalleria Rusticana), Elisabeth (Tannhäuser), Fiordiligi (Cosi fan tutte), Amelia (Ballo in maschera), la Femme (La Voix Humaine), la Femme (La Dame de Monte-Carlo), Arabella (Arabella), Donna Anna (Don Giovanni), Ariadne (Ariadne auf Naxos). She then returned to France, called by the artistic agent Jean-Marie POILVE, and worked as a freelancer. Her first contract led her to Marseilles for « Der Freischütz ». Alain Duault wrote a laudatory review, saying a new great French voice had appeared. During her first year in France, she sang in Nantes, Orléans, Metz, Montpellier and the Opéra-Comique, and during several concerts of Radio-France. Her repertoire grew more and more: Agathe (der Freischütz), Rezia (Obéron), Vitellia (la Clémence de Titus), Elettra (Idomeneo), Léonore (le Trouvère), Mimi (la Bohême), Sieglinde (die Walkyre), la Comtesse (les Noces de Figaro), la Cantatrice (Reigen), Medea (Freispruch für Medea), la Comtesse (Cappriccio), la 2ème Prieure (les Dialogues des Carmélites), Fidelia (Edgar), Catherine d’Aragon (Henri VIII), Valentine de St-Bris (les Huguenots), Marguerite (The Damnation of Faust), Cassandre et Didon (les Troyens), Grete (der Ferne Klang), Anita (Jonny spielt auf), Ariane (Ariane et Barbe-Bleue), Alceste (Alceste), Bérénice (Bérénice), Brunehild (Sigurd), Mathilde (Guillaume Tell), Elisabetta (Don Carlos), Amelia (Simone Boccanegra), Alice Ford (Falstaff). In February 1994, she was awared the first French Victoire de la Musique Classique as Lyrical Artist of the year. This award consecrated an outstanding career that had started only ten years earlier, divided between lyrical stages, orchestral concerts, chamber music concerts and recitals. She worked with the greatest conductors, such as Pierre Boulez, Sylvain Cambreling, Jean-Claude Casadesus, Michel Plasson, Georges Prêtre, Semyon Bychkov, Ricardo Chailly, Charles Dutoit, Carlo Maria Giulini, Marek Janowski, Pinchas Steinberg, Seiji Osawa, Yutaka Sado and others. Thanks to these collaborations, she had the opportunity to sang throughout the world. Invited by prestigious Opera Houses like the Teatro Colon of Buenos Aires, the Fenice of Venise, the Met of New York or the Opéra Bastille, and by illustrious orchestras like the Orchestre de Paris and all the great French national orchestras, the London Symphony Orchestra, the Konzertgebow Orchestra, the Accademia Nazionale di Santa Cecilia, the Philharmonic Orchestra of Israel, the Royal Orchestra of Copenhagen, the New York Philharmonic and, more recently, the Chicago Symphony Orchestra to celebrate the 80th anniversary of Pierre Boulez. With her uncommon character, she creates the role of the Singer in the opera « Reigen » of Philippe Boesmans at the Monnaie (Bruxelles, 1993) and, at the Hamburg Opera House, she creates the title role of Rolf Liebermann’s last opera, « Freispruch für Medea » (1995). The years she spent learning as an instrumentalist as well as the years she spent in Germany made her a recitalist; she always favoured this side of her career and performed with numerous musicians such as Jean-Marc Luisada, Pierre-Laurent Aymard, Brigitte Engerer, Philippe Cassard, Jean-François Heisser, Dalton Baldwin, Roger Vignolles, Augustin Dumay, Bruno Fontaine, Claude Lavoix, Laurent Korcia, le Quatuor Parisii, Philippe Bernold, Alexandre Lagoya, le trio Wanderer, the Nash Ensemble of London, the ECM2 Ensemble, Cord Garben… but also Sacha Distel, William Sheller, Gilbert Montagné, Juan José Mosalini, Sortie d’Artistes, Fabienne Thibault, Jean Claude Vannier. At the public’s demand, she was chosen by the World Youth Day to welcome the pope John Paul II in Paris, in front of the Eiffel Tower (1997) and by the City Hall of Paris to pay homage to Maria Callas, for the 20th anniversary of her death (1997). Françoise Pollet has teached at the CNSMDL (Conservatoire National Supérieur de Musique et de Danse de Lyon) since 2002-03. She has given numerous Masterclasses : at the Opéra-Studio of Strasbourg “les Jeunes Voix du Rhin”, at the Maurice Ravel Academy (St Jean de Luz), at the Summer International Academy of Nice, at the Musikakademie of Amsterdam, at the Musikhochschule of Freiburg, at the Franz-Liszt-Hochschule of Weimar, at the Centre de la Voix of the Rhône-Alpes region, at the Royal Concervatory of Brussels, at the McGuill University Montreal, and at the 1st Academy for French Music Maestro Michel Plasson. Françoise Pollet is Knight of the Order of Merit and of the Order of Arts and Letters. Contact with the form above.